With the agency’s information technology modernization roadmap complete, U.S. Patent and Trademark Office Chief Information Officer John Owens is turning his attention to software. In an interview with FedScoop, Owens said the USPTO’s automated systems were built – in some cases – approximately 40 years ago and has been carried through various updates and upgrades, but is not in line with modern technology. “I joke that we need to keep EMTs around to resuscitate some of the folks that know the code some our systems are written in,” Owens said. Owens is using open source and agile development to rewrite the more than 200 automated systems the agency uses. 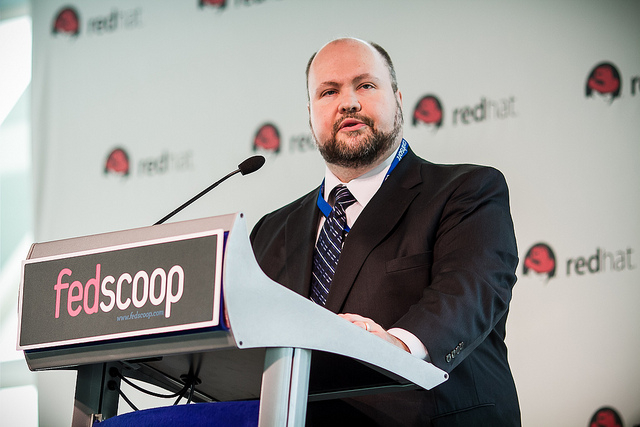 Using mainly Red Hat’s CloudForms, Owens said USPTO would focus on bringing a better set of Internet technologies to the agency’s more than 11,000 employees. The USPTO does, in fact, operate as a business, receiving federal taxpayer appropriations set at projected fee revenue from patent and trademark users. Patents End to End: A set of new and improved patent examination tools that reflect an exciting next-generation technology solution for an automated, fully integrated patent processing system capable of handling the demands of USPTO’s workload and needs of a sophisticated intellectual property community. Trademark Next Generation: The agency’s trademark system that Owens said has become unsustainable in the current technical environment based on outdated technologies. The program will provide trademark applicants and trademark owners the ability to manage applications and registrations online, as well as an automated watch service to notify requestors of status changes in applications and registrations. Fee Processing on Next Generation: Owens wants to adopt the eCommerce idea of a shopping cart that allows people to shop for the USPTO products and services they need in a familiar online shopping environment. MyUSPTO: Will allow users a single sign on and in the future allow people to access their entire portfolio of USPTO products. Users will only need one username and password to access all of these services, something Owens said is very important for his team to implement. All of these projects will be completed within the next few years, done on a two-week agile development cycle. Owens said with the USPTO expecting to get a new director soon, his priorities could be altered, but the projects he mentioned will take center stage for the immediate future. All of that falls in line with his view of the role of IT.